Analyzing and controlling videos more vividly. Making scenes brighter or darker by moving control bar. Images shall immediately begin being recorded and stored from a certain time before the accident to a certain time after the accident since an impact sensor automatically senses the impact(, if a car accident occurs) while driving. It stores records of the vibration status of front and back, right and left and top and bottom of sudden acceleration, sudden stop and sudden spin while driving. 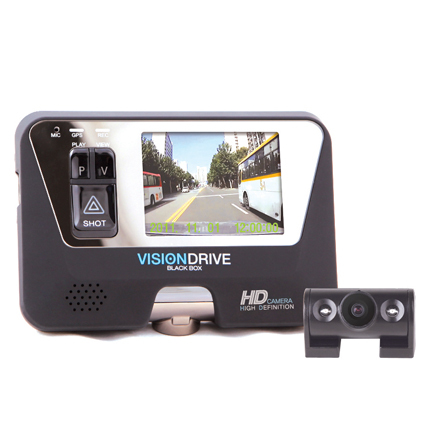 The recorded scenes of the accident at the stopped status of the car is played and checked on the Vision Drive’s LCD screen. Recording voice and sound can be on or off by the user’s request, by holding down the Shot button for over 3 seconds. Encryption feature is included for user’s privacy. Video in the Vision Drive only can be played on VD Analyzer Software after the user inputs the correct passkey/lock.